With over 160 vendors, live entertainment, and the finest tasting maple syrup produced in the world, the Festival of the Maples in Perth is the place to be on Saturday, April 26th, 2014. You may not know that Lanark County is the maple syrup capital of Ontario, and you may not know some of the history leading up to the very first festival that was held back in the 1970s. Years ago, many of the local farmers produced maple syrup. Some just made enough for their families and for some it was a supplement to their farm income at a time of year that was less busy than during the summer months. There were also a few dealers in the area that sold sugar bush supplies – Max Miller of Snow Road, Percy Drysdale of McDonald’s Corners, and W.J. Ballantyne in Lanark. 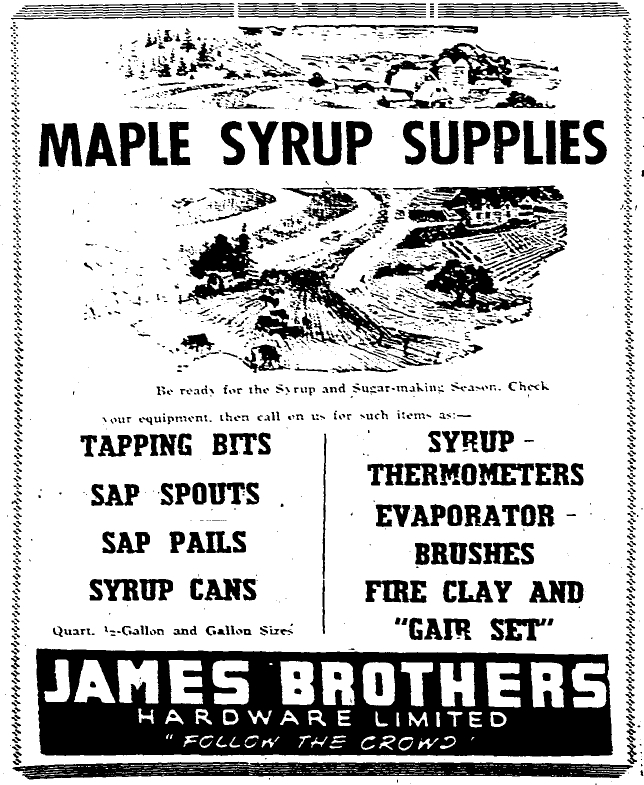 James Brothers Hardware and the Co-Op also sold supplies for maple production. Labels for the bottles were often printed by ‘The Perth Courier’. The Korry family across the road from us had a medium sized sugar bush and they produced not just enough for the family, but enough to sell locally. Andrew’s son-in-law John Chaplin sold it through his dairy to the local customers on the milk routes. Andrew Korry and his son George spent a few very busy weeks making syrup each spring and my brother Tim worked with them in the bush one year. They used a team of horses with a tank mounted on the sleigh to draw the sap back to the evaporator at the sugar shack; typical of many other producers at that time. The Bowes and the Miller families near Glen Tay also produced their own syrup. I remember that Art Bowes used to tap quite a number of trees in the mid-sixties. Their farm was known as Tayview farm and it straddled the Tay River and was very picturesque. At that time they had about 300 acres which included hay fields, pastures and of course maple bushes. His son Doug was on our school bus and he used to talk about helping his Dad back in the bush each spring. The Miller family’s farm, known as Tayside was owned by Ernest ‘Ernie’ Miller and his wife Evelyn (Mather). The Miller family arrived from Scotland in 1809 and their farm was purchased by Ernie’s great grandfather Dodds in 1858. Their kids were Diane, Nancy, John and Ruth. Evelyn was a lovely, soft-spoken lady and she was my first 4H club leader. I also remember that Ernie was tapping about 1,500 trees back in the sixties and had about 30 acres of maple woods. Ernie was a forward thinker and one of his ideas at that time was that sap should be gathered by trucks from each farm and taken to a large central evaporator – similar to the way that milk was trucked to cheese factories. It seemed through the years that Ernie was into everything. When he wasn’t farming he wrote history books, he researched genealogy, he worked with young people and it was no surprise to me when he was inducted into the Ontario Agricultural Hall of Fame in 2003. The McEwen clan in Ferguson Falls was another family who made their mark in the maple syrup business back in the 60s. In 1966 Robert McEwen of Prestonvale opened up the first pancake house in the area. Originally, Robert made his syrup the old fashioned way out in the bush and boiled a cauldron of sap over the fire. Later, in the 1970s I remember that he was one of the first to use plastic pipelines to bring the sap from the trees to one main location. Dad knew the McEwen family well, having grown up in that area and said that Robert often spoke of the difficulties involved in syrup production. There were always problems like getting reliable labour and often the lack of capital to purchase new equipment. Robert was very active in the local industry and at one time was the President of the Lanark and District Maple Syrup Association. Ken VanAlstine in Maberly had over 2,000 trees tapped when I was a kid and he was among the first to use pipelines. He experimented at first and tapped just 200 trees using the pipeline system but the rest was collected in buckets the traditional way and transported to the evaporator by horse and sleigh. Ken, like other producers in the area found the cost of hiring labour prohibitive and that distributers wanted too much money per gallon. Ken was well known in the area for his excellent quality maple syrup and said on his best day at that time he gathered 3,300 gallons of sap. Another local family of producers was the Adam family of McDonald’s Corners. Leonard Adam and his brother Tom tapped an average of 2,250 trees and had about 500 acres of land between them. They were hard workers and spent many days sawing, chopping and stacking the 20 cords of wood required for their evaporator and were one of the first to use a brand new style of evaporator which was 4 by 14 feet. They produced enough to sell locally and the remainder was shipped out West. Brien and Marion (McLaren) Paul of R.R #3 Lanark had a 575 acre farm about three miles west of Hopetown and began maple production in 1953. Marion was raised on a farm near the village of Lanark, was known locally as the ‘First Lady of Maple’ and became a maple judge at the Royal Winter Fair in Toronto. Their kids Kathy, Wayne and Darrell were also very involved and provided additional labour for the family business. In 1972 Kathy was even crowned Maple Queen in the local competition. Back in the 1960s they used two sleighs, one pulled by a tractor and the other by a team of horses. Brien’s father Raymond Paul often tended the evaporator, keeping a watchful eye as the steam boiled off into the air. Russell Foster and Raymond Watt often assisted the Paul family with the production. They tapped an average of 4,000 trees at that time and produced about 700 gallons of syrup and used approximately 30 cords of wood during the season. The Paul’s were pioneers in the maple industry and were very modern in their approach. They were one of the first to install plastic tubing and an oil fired evaporator. The plastic pipes were attached to the tree spiles and the sap flowed through the pipes and emptied into a storage reservoir located behind the evaporator. Brien and Marion were inducted into the International Maple Hall of Fame and were members of the Ontario Maple Producers and the Lanark and District Maple Producers Association. Gibson was a name known for their excellent syrup. James ‘Carman’ Gibson and his wife Edna (Rodger) had a maple business in Dalhousie Twp at R.R. # 4, Lanark. The nearby areas of Hoods and Poland were also known for their fine quality maple syrup. The Gibson family began tapping trees in 1821 with the arrival of James Gibson from Lanark, Scotland. He was the first pioneer settler in the area and named their new home Lammermoor after the Lammermoor Hills in Scotland. Their five children Verna, Beatrice, Norma, Carol and Earl all helped out with the operation. They also raised beef, dairy on their busy farm and hauled milk to the Middleville cheese factory. When locals think of a long running maple operation, the name Dodds comes to mind. They had a substantial sugar bush at R.R. 2 Clayton in the Lanark Highlands. The Dodds family has owned Springdale Farm for generations and Don and Marion Dodds and their sons Bryan and Stephen helped with production through the years. The family has won many awards for being long term maple producers and as recently as last year Stephen Dodds won Grand Champion Trophy at Perth Festival of the Maples for 2011. Their long, long, list of awards include trophies for World Champion Maple Syrup, Sugar Maker of the Year, and a meeting with HRH Prince Charles at the Royal Winter Fair. One of the maple syrup families that I remember fondly was the Coutts family on the Rideau Ferry Road. I’ll never forget how George Coutts used to invite the local kids to visit his sugar shack and he would take the time to patiently explain how the maple syrup was made. Miss Norma Devlin from the North Elmsley School was invited each year to bring her grade one class to visit the Coutts farm. George along with his son Kenneth showed the children how syrup was made and even provided the kids with some maple taffy at the end of the tour. At that time the Coutts family was tapping about 1,300 trees and produced more than enough syrup for both the family and for area sales. The ancestors of the current Fulton family began to tap their maple trees back in the 1840s. Their large 370 acre farm is located between Almonte and Pakenham and they have tapped their huge 4,000 tree sugar bush for generations. Well known for their high quality syrup they have also operated a pancake house for many years and their sugar camp has been a popular attraction for both area families and visitors. With these and so many other excellent producers in Lanark County, it’s not surprising that back in the 1970s there were talks of having a maple festival in the town of Perth. It was Vic Lemieux, owner of Norvic Lodge at Christie Lake, who first came up with the idea and presented it to the Perth Chamber of Commerce. Vic was successful in his campaign to launch the first festival, with the hopes that it would bring people out to celebrate the spring season after a long, cold, winter. When we arrived at the Festival that Saturday, they had closed part of Gore Street and Foster Street and the local maple vendors had set up their displays. At 10 a.m. the Festival was officially opened by the Ontario Minister of Industry Claude Bennett. The Legion ladies and the ladies from St. Andrew’s church had home baking for sale, and there were also side-walk sales on Gore Street and many arts and craft exhibits. There were a tremendous number of district producers and many of them offered syrup for sale in various sized containers. Pancakes were available for purchase and free samples of Balderson cheese were given away and I recall we went back a couple of times to that booth! One of the oddest things was to see a wood burning evaporator set up on one of the main streets of Perth. I’ve seen a few of those out in the bush, but I never thought I’d see one in town! Fiddling and step-dancing competitions were held that year and I remember Dawson Girdwood saying that some of the best fiddlers from Eastern Ontario were competing in the open and junior fiddling classes. Jimmy Heney, one of our neighbours won the fiddling prize hands down, as he often did and Karen Grey of Perth was the top step-dancer that night. The folks in Perth were always up for a good beauty competition and so part of the evening program at the arena that night was the crowning of ‘The Sweetest Girl in Lanark County’. Miss Perth 1975 Michelle Hughes crowned the winner, Maple Queen Susan Thompson of Perth. Over the years we always attended the Festival and each spring it seemed to grow by leaps and bounds. Every year it seemed that there were more vendors selling their maple goods, more artisans displaying their crafts and an increasing number of booths and displays. We also noticed a steady growth of tourists who had come from Ottawa, Kingston and even as far away as the States to visit. People in Lanark County, understandably, have always taken their maple syrup very seriously. Because of this, it was devastating to many when January of 1998 brought the most destructive ice storm in Canadian history. From January 4th to 10th Lanark County was severely affected by freezing rain and ice pellets that fell and accumulated on tree branches day after day. This ice created a thick, heavy coat, damaging both the maple trees and the pipelines in the sugar bushes. Millions of tree branches were caked with the build-up of ice and became so heavy that they split right off of the trees; severely affecting the sap flow. At the time, there were speculations that it could take forty years for production to return to normal. Many of us, have participated in making maple syrup at one time or another and know from experience that it’s extremely labour-intensive. We also have a clear understanding of the enormous amount of sap it takes to make a very small quantity of syrup. No matter how modern the equipment or methods, it still takes forty gallons of sap to make one gallon of syrup. Now, add in the hours of labour for the tapping, transporting from the tree to the evaporator, the boiling down, the straining, the bottling and the labeling. Next, factor in the cost of equipment such as the spiles, the pails or tubing, the evaporation tank, fuel, the straining equipment, the bottles, cans and cost of transporting to market. Fifty dollars a gallon really doesn’t sound like all that much anymore now, does it? So, the next time you pass by the maple syrup display in the grocery store aisles, or visit a maple vendor at his farm or at a festival, please remember how it’s produced. Remember the proud, hard-working families who settled in Lanark County and passed down their knowledge through the generations. Think of the enormous quantity of sap required to make a very small container of syrup. Most of all please stop and consider the origin of your syrup and take it from this Lanark County kid – you won’t find any better, more flavourful syrup, than from the Maple Syrup Capital of Ontario. This entry was posted in Short Stories and tagged Andrew Korry, Arlene Stafford-Wilson, Books maple syrup, Bowes Glen Tay, Brien Paul maple syrup, Don Dodds Marion Dodds Clayton, Ernie Miller Glen Tay, Fulton maple syrup, Fulton Pancake House, George Coutts Rideau Ferry, George Korry, James Gibson Dalhousie Township, Ken VanAlstine maple syrup, Lanark County maple syrup, Leonard Adam, maple syrup ontario, maple syrup Perth Ontario, Marion Paul maple syrup, McEwen Prestonvale maple, Perth Festival of the Maples, perth maple festival, Tom Adam McDonald's Corners, Vic Lemieux maple festival, Wheelers maple syrup. What fun this is! What a great story. We visited the Oliver’s Sugar Shack this weekend. Things are going great guns over there. The new equipment is amazing, but they had some old kettles on hand. Our grandchildren, and son-in-law (an engineer) were fascinated! It’s been fascinating over the years to witness the changes in the methods for producing syrup. My Dad used an old carpenter’s auger to tap our trees at home and we collected the sap by hand, so things are certainly more efficient these days!